Accounting software is no longer text laden and dull looking. With high speed processing, gigabyte measured RAM and terabyte filled storage capacity, accounting software is presented in slicker fashion. One expects to see spreadsheet features and graphs built into reporting. In this post, we concentrate on drill downs. 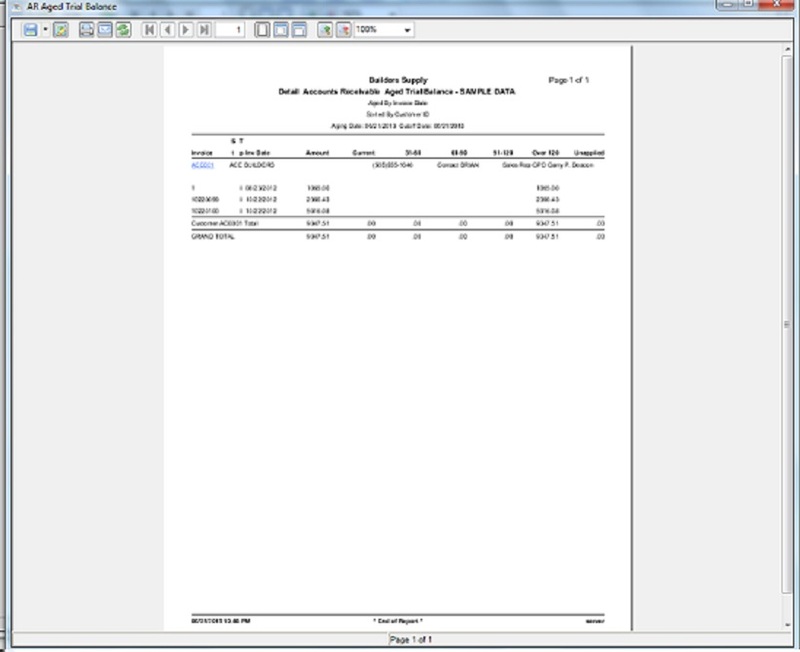 One product generates an A/R aging report as a print preview in summary format. In the example below, note that the customer id is colored in blue and underlined to offset it against other pieces of data on the row. This allows the report user to first review the information in summary format eliminating the need to weed through several pages and only then bring up the extra detail on demand. 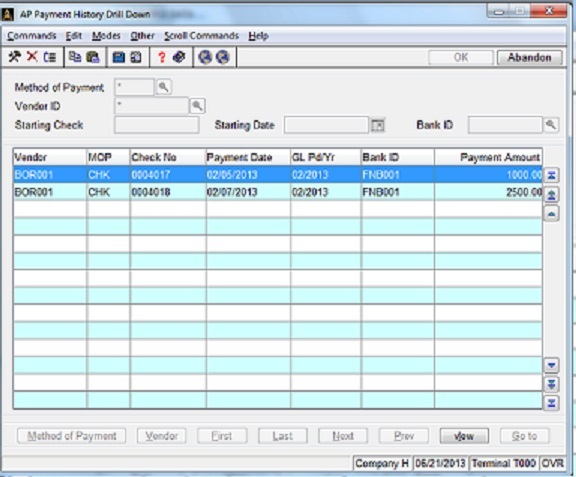 In the above example, the summary line indicates cash is withdrawn from the bank due to A/P check writing. The supporting detail indicates the check info. It is not unusual for a business to assign Prox Terms for customers. This is the fancy way of saying that you are counting the number of days due from the beginning of the next month instead of from the invoice date. 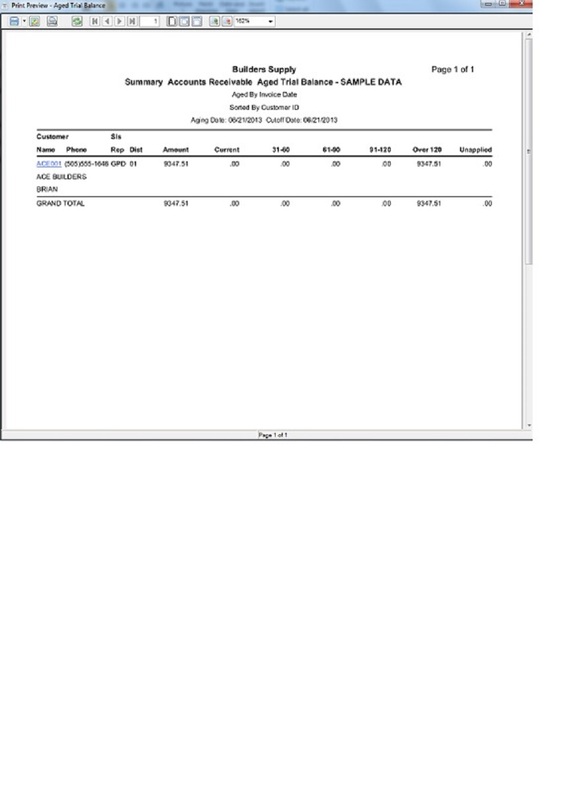 Net 30 Prox on an invoice generated on July 6 is due August 30. If you give the customer Net 30 Regular, then it is due August 5 as there are 31 days in July. from the start of the next month. If you invoice the customer on June 30 with a Net 10 Prox, it is due as soon as July 10. Due to recent actions by the Federal Government, human resources departments must now also track compliance at both the employee and company level with the Affordable Care Act (ACA). into an employee’s time ticket may also be able to update a job cost database or vice versa. In effect, killing two birds with one stone. There is also the human resources side of employee relations. This portion of the database keeps track of incidentals about an employee as well as tracking pay raises, anniversaries, sick and vacation time, etc. 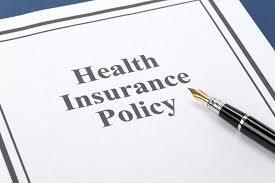 1) Is the employee considered eligible for a low-cost health insurance policy? 2) Does the employee have his or her insurance through the company or through a partner’s or spouse’s policy? 3) Has the employee rejected owning insurance and is willing to pay the penalty? 4) Is the company at risk for paying penalties for non-compliance? Most payroll or even human resource modules in accounting systems do not currently address these issues. The Federal Government may eventually make it mandatory for businesses to generate specially designed forms and submit quarterly or annually just as they do 941s and W-3s. When this comes to a head, expect that accounting systems will provide this as standard feature. Until then, expect to maintain customized, ancillary data in order to tabulate the required reports. A fair question to ask when overhauling your company’s computer system is: Do we buy a Windows or a Linux server? The answer: Depends on your needs. A Linux server is the popular choice when running web-related applications such as html and php-based websites. More often large-scale web hosting companies promote their linux-based servers as very reliable and they usually are. Sites that use ASP script programming and .Net languages generally use Windows Servers. Most web-based open source applications, though, are written in PHP. This usually refers to readily available, non-fee licensed programs that can be taken and enhanced as required. There are many software programming entities that distribute open source products and charge only for the assistance with installing and tweaking the programs. After all, nobody provides service for free. Office productivity software such as word processing, spreadsheet and presentation applications are designed with the Windows operating system in mind. There are variations of these products that run on Linux but don’t have anywhere near the market share. In a business where there is not a staff of computer engineers or technicians available to deal with the immediacy of day-to-day issues, it probably makes more sense to stick to a Windows server. Today’s accounting systems utilize built-in emailing functionality, saving reports and documents to archive folders along with the need for frequently reading and writing to specific files in a designated folder. These are better managed as Windows services than as Linux services. There are more tech savvy personnel out there who are experienced and readily available to do the necessary forensics in a Windows server environment than in a Linux environment, especially for heavy user-dominated applications. Additional layers of configuration are required for Windows workstations to communicate with a Linux server as opposed to the more shared history of Windows workstations to Windows servers. If something needs attention on a website, most users expect that the webmaster’s team of Linux professionals will take care of the problem. But in a wordprocessing or spreadsheet emergency, most users don’t want to deal with and wait for a high level techie. They expect someone in their own workgroup to be able to see what is happening on the server. This is so much easier to do when action on the server looks pretty much like working on one’s own workstation. On a linux box, most often the user must go to a # prompt and enter arcane commands such as grep, ls -l, and chmod. Author Larry TerenPosted on May 18, 2015 May 18, 2015 Categories UncategorizedLeave a comment on Windows or Linux? id, company name, address1, address2, address3, city, state, zip, phone, fax, contact, terms, taxable, taxing authority, tax exempt id, credit limit, credit hold and sales rep.
Each of the above fields should be assigned a maximum number of characters so that it is easier to plot reporting as well as accesibility and readability outside the system. The id field should be a fixed length capable of accepting alphanumeric characters. A search on a customer should be available by: id, company name, phone number. Low cost accounting software solutions such as QuickBooks tend to downplay the need for using a customer id thinking that most users prefer the name lookup. It is better, though, to have an id with a fixed length to make record extraction outside the system easier to coordinate. Low cost solutions, however, tend to discourage accessing data outside the system. Use of a shortened specific customer id makes it easier to link customers to open invoice and sales history records for quicker access on reports and screen inquiries as well as taking up less data storage space as a field in those related records. Text in some acounting systems are case sensitive. For example, a search on Alpha Baking Company is not the same as ALPHA BAKING COMPANY. There may be only one customer record as such, but the software user may be forced to try variations on mixed case and spelling to find the customer. A good system should also allow for user defined fields that may be added and reported on. A business needs to weigh the limitations of low cost software solutions against the need to be flexible with system reporting. 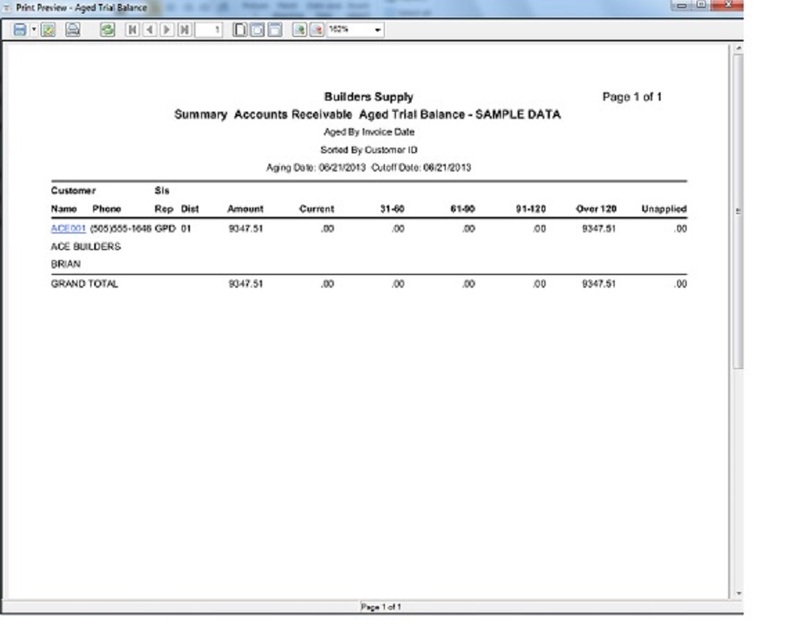 A standard feature on the Inventory Sales Analysis Report is the Annual Turns calculation. It represents how many times an item turns over its stock in a year’s sequence. The formula usually used is: cost of goods sold divided by inventory value. In other words, if you have sold $50000 worth of your entire goods and its average cost value is $25000, then you have turned it over twice. If this represents only the first 4 months of the year, then it is interpolated to mean that for the entire year, it will be three times that or an annual turn of 6. A company that has a higher annual inventory turnover than a competing company is naturally valued higher. Some businesses tend to overlook this piece of data and focus more narrowly at the quantity sold year-to-date on an item or product line compared to the previous year. There may also be quarter to quarter comparisons in order to determine which items are fast or slow movers that are not seasonally affected. Annual turns help a business determine how often they need to make sure the product is purchased or made. It is important that there be someone in your organization that takes the time to examine the analytic reports and use them as a tool to benefit the company. In any event, make sure your accounting system contains annual turns on the standard sales analysis report. 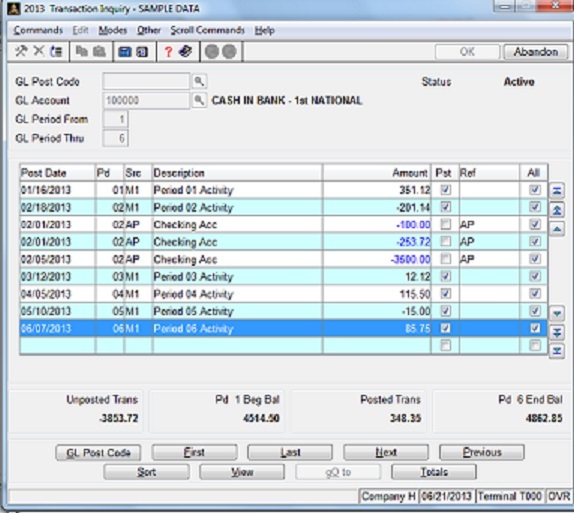 The backbone of a computerized accounting system is the access to immediate reporting on customer and vendor balances. A good system allows you to control the reporting on both customer and vendor aged balances by the selection of cutoff dates. You should be able to reconstruct aging reports from previous periods and prior years as far back as necessary. A good system will accommodate this by allowing you to select how far back you retain paid-up invoices. In an audit, it is not enough to be able to show the A/R or A/P balance in a GL Trial Balance. You may also be required to show the detail of invoices still open until the end of the selected GL period to validate the GL figures. Most businesses will keep no more than a year of paid invoices in case it is required to reconstruct earlier Aging Reports. Relying on a hard copy or PDF version of a aging report at the time the given month is closed may not be enough. Why? Because sometimes back posting of adjustments to earlier balances may make these “closed” reports obsolete. Author Larry TerenPosted on May 4, 2015 Categories UncategorizedLeave a comment on Payroll Service or In-House?